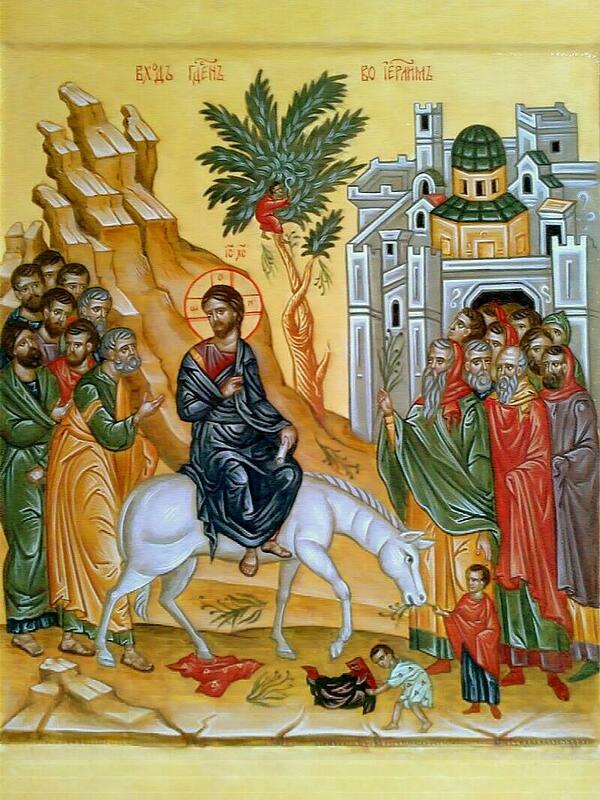 My religious tradition typically commemorates this day as “Palm Sunday,” based on the lines in Matthew and Mark (but not here in Luke) that have people cutting branches from nearby trees and laying them on the ground before Jesus to give him a semi-sort-of-almost kingly passage into the city. On the other hand, there are many traditions which commemorate this day as “Passion Sunday,” and they have an entirely different take on the day. Here his entrance is as the incoming King; in the others, his entry is portrayed as the beginning of the week of his death. Some people argue, in fact I have on occasion, that the triumphal entry is premature. That is, it seems to steal some of the celebration of Easter and it helps people avoid the ugliness of Maundy Thursday and especially Good Friday. Few people go to a Maundy Thursday service these days, and almost nobody does Good Friday. So they say that we should go with the version that emphasizes the entrance to the Passion because people won’t get the suffering of Jesus otherwise. In spite of their differences, the story is in all four Gospels and all of them portray it as a celebration of an arriving rock star. However, just so it isn’t all dancing and light, Luke does follow the story with an objection from the Pharisees, telling him to order his followers to stop (presumably because they were good church people and didn’t think it was proper to have a good time while welcoming Jesus). And Jesus’ does respond to the Pharisees with the somber comment that the urge to celebrate is so great that if he got these guys to stop singing, then the stones themselves would take over the job. First, in Mark’s parallel to v. 37 there is reference to the bystanders throwing down their cloaks and “leafy branches,” but Luke doesn’t have that. Instead he simply says that “As he [Jesus] was now approaching the path down from the Mount of Olives, the whole multitude of the disciples began to praise God joyfully with a loud voice for all the deeds of power that they had seen.” No branches, leafy or otherwise, are anywhere on the scene. The second is in vv. 39 ff. where the Pharisees tell him to order his disciples to stop and he tells them that if they were silent then the very stones would shout. That’s not in Mark. In fact it’s only in Luke, not in any of the other Gospels. Other interesting changes from Mark. When the acclamation begins, Mark’s version says simply that “...those who went before and those who followed cried out...” But Luke has them reveling in joy. He adds “all the multitude of disciples” are “rejoicing” (xairontes) and praising (ainein) God “in a loud voice” (phone megale) for all the “mighty works” (dunameon) which they had seen. Luke's scene is far more celebrative and joyous. This loud acclimation from the crowd is not the first time that this has happened. Luke often bursts into song in extravagant ways. Look back at the birth stories and you’ll see again and again angels opening up and singing lines straight out of Handel (or maybe Handel quoted them, but whatever…). Here is a quick outline of the four elements to the story. Third is the acclamation by “the whole multitude of the disciples” (v. 38). As we’ve noted, in Luke there are no "leafy branches" (let alone, actual “palms”), just the praise of the people, and Luke is the only Gospel who adds King to the acclamation. Instead of “Blessed is the one who comes in the name of the Lord.” Luke has “Blessed is the King who comes in the name of the Lord. And the fourth element is the objection of the Pharisees (v. 39), which is also unique to Luke, but it brings the reader back to the realization that this is not an entrance into a coronation, but into a betrayal and death. There are also a few historical problems with the story. Nothing serious, but they probably need to be talked about. The first has to do with the donkey. 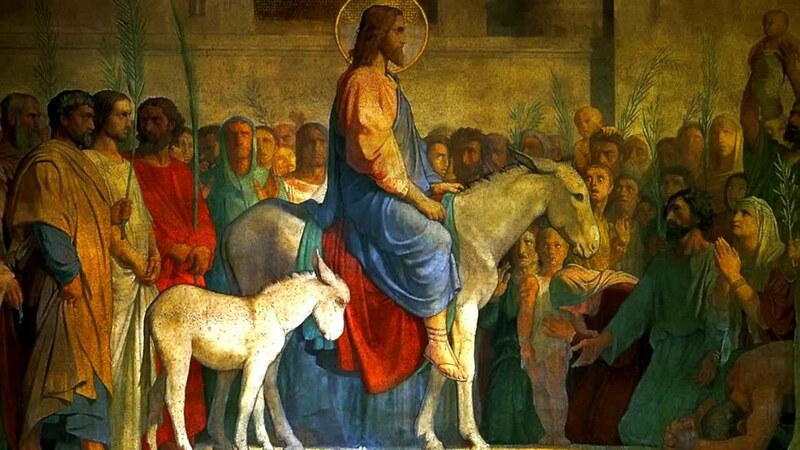 There’s nothing wrong with Jesus entering Jerusalem on a Donkey. Rabbis doing that with their disciples following was not unusual. And there is nothing historically problematic about his disciples acclaiming him to be the messiah. The problems arise when those two things are brought together into the same story. If he came into town on a donkey, deliberately re-enacting Zech 9:9, it would be as a political messiah and not only does that not look like Jesus, it also would have been cause for his being arrested immediately (not at the end of the week). Similarly if his disciples acclaimed him to be the Messiah publically, everybody would have been arrested and probably all killed. So, scholars cautiously say that, on the one hand it is very likely that Jesus came into town on a donkey followed by his disciples. And on the other hand, it is likely that they only later interpreted it in terms of Zech 9:9. The finding of the colt, unridden for Jesus to ride on is sometimes seen as showing evidence of this being a fanciful legend. And it may be. It is also possible, however, that some prior arrangement had been made that the reader is unaware of. It is not impossible that Jesus had conversed with a follower earlier in his journey who offered his colt when Jesus came to Jerusalem, and Jesus is now just following through on the offer. We can’t know for certain. An interesting thing about the colt is that Greek for colt is polos which actually means a “young animal” of any kind. Usually, when the word is used alongside another animal, it means “donkey,” but when it’s used by itself, it means “horse.” So, technically, it could rightfully be “Horse.” However, both Mark and Matthew understand it very clearly as a donkey, and the cultural context lends itself to donkey as well: there were few horses owned by peasants in those days and many, many donkeys. Many people had animals that they kept only to lend or rent out. And this one could have been one of those. Animals that were kept for sacred use or royal use (and Jesus’ entry into Jerusalem could be considered both) were not to be put to ordinary use. That could explain why the colt had never been ridden. According to British biblical scholar, Alastair Roberts, donkeys have held a subtle, but strangely central, role in many of the major turning points of ancient Israel history. For such a lowly beast of burden, it is surprising to see how unobtrusively significant a role the donkey plays in the history of Israel’s kingdom. While it seldom occupies the centre of the narrative frame, it is a ubiquitous yet inconspicuous presence at pivotal historical moments in the kingdom’s establishment and a supporting actor in prophesies concerning it. At times it serves to reveal or highlight the identities and destinies of key protagonists; at others it precipitates or plays a part in setting in motion key events. Here are a few examples. In 1 Samuel 10:14-16, Saul becomes King in part because he is out in the wilderness looking for donkeys that belonged to his father, and he stumbles across the prophet Samuel, who (after a test) anoints him King. In fact, Saul was the first King, supporting Robert’s notion that donkeys are present at key junctures. In 2 Samuel 16:1-2, when David was in hiding because his son, Absalom has taken control of the country in a coup, Ziba, a servant of Jonathan’s sons, comes to him with abundant supplies for the wilderness, on the backs of donkeys. Incidentally, is it justice or an accident that the scheming rebel, Absalom was later killed because his donkey walked under a low branch of a tree and his hair got tangled in the branches and he was left hanging there until he died (2 Samuel 18:9-11)? Generally speaking, and germaine to our passage today, donkeys or mules were considered the animals of kings, but specifically stood for peaceful rule, while horses were the animal more identified with war. The “donkey passage” that is actually quoted in the Gospels’ telling of Jesus’ entry into Jerusalem is Zechariah 9:9-10. It was written after the devastating captivity in Babylon, when there was no real king left in Israel. No ruler, no leader, and very little hope. And, yet, there was this prophesy that said that what God intended for Israel was for there to once again be a King, and this time it would be a King of peace (arriving on the back of a donkey) who would be humble, would “cut off…the chariot…the war-horse…and the battle bow,” and would “command peace to the nations.” It was an unlikely, but magnificent, dream of an ideal of what Israel ought to look like, if it ever returned to the promises and aspirations that God had created it for. And it is not insignificant that Jesus (or his later biographers) chose this image as the model for his entrance into the corrupt and crippled and brutal power structures that Jerusalem had actually become. All of these things--the frankly modest attendance, the lack of “leafy branches,” the quoting of the humble king passage in Zechariah--all come together to say that this was probably not the grand “Triumphal” entry that most of us have come to celebrate. At least it wasn’t, according to the re-telling by Luke. Even the place that he entered and the time in which he entered, might have carried some of that same symbolism of subtle, humble, power. Interestingly, the very day that Jesus entered Jerusalem, there was another, much mightier, in terms of human power, entering from the other side of the city. Pontius Pilate, always came to Jerusalem on that day to be in Jerusalem at the time of the Passover (it was, after all, a celebration of God freeing oppressed people, so the Roman Guard had to be there). When Pilate entered, he came with all the trappings of empire and might that he could muster. According to New Testament scholars, John Crossan and Marcus Borg, it was a “visual panoply of imperial power: cavalry on horses, foot soldiers, leather armor, helmets, weapons, banners, golden eagle mounted on poles, sun glinting on metal and gold. Sounds; the marching of feet, the creaking of leather, the clinking of bridles, the beating of drums. the swirling of dust. The eyes of the silent onlookers, some curious, some awed, some resentful. Pilate entered through the mighty, fortified archway at the front of the city. But at roughly the same time, Jesus and his donkey and peasant entourage, were entering also. Jesus was simple Rabbi from Nowheresville, Galilee, who road on a donkey and was cheered by peasants, while Pilate was the imperial power of Rome and able to cut off the heads or tie to a cross anyone who was caught proclaiming allegiance to any King but Caesar. The visuals of that, the contrast between the two, was surely not lost on many people that day. Perhaps the message of this day, is just the story of a young prophet named Jesus who came into the midst of violence while embodying peace. The contrast between a peaceful prophet and violent leaders is the story. He proclaimed a kingdom (or “realm”) of peace for a world that needed it, but whose leaders didn’t much care for it. It seems interesting to me, today, that while many so-called “mainstream” denominations are making statements condemning the violent (and racist, and bigoted, etc.) rhetoric of Donald Trump, many evangelical Christian leaders have come out in support of him. The list includes, Jerry Falwell, Jr., Pat Robertson, Ben Carson, Franklin Graham, Dallas megachurch pastor Robert Jeffress, Mike Huckabee, and others. When asked why, most disagree with some of Trumps racial and ethnic statements, but say they support him because he is strong. He is powerful. He will protect the US from invasion by ISIS, or “illegals.” They seem to be supporting him because he would do everything that the Prince of Peace from Nazareth would NOT do. (Harper Collins, Mar 17, 2009), p. 3. For example, see these statements by leaders of the Episcopal Church and the United Church of Christ: “As Holy Week approaches, 'A Word to the Church'” (www.ucc.org/news_as_holy_week_approaches_a_word_to_the_church_03172016). David French, “Donald Trump Is No King David: It’s Time for Christians to Take a Stand” National Review, March 14, 2016 (www.nationalreview.com/article/432791/donald-trump-christian-supporters-its-time-take-stand-against-trump). Retrieved 03/15/2016..
 “Went on ahead.” (eporeuto emprosthen/επορευετο εμπροσθεν). Imperfect middle. “Went on before.” And “went up to Jerusalem.” (anabainon eis Ierosolyma/αναβαινων εις Ιεροσολυμα). The phrase, “Journeyed to Jerusalem,” is a very common expression in Luke. Mark has “drew near” (without he word, “Jerusalem”). The theme of journeying to Jerusalem dominates 10 chapters of Luke, about 40% of the book. (Between 9:51 and 19:28, Luke uses the word “journey” nine times.) He uses the word, “Jerusalem” more than all of the other Gospel writers combined. Bethany and Bethphage were villages on the eastern side of the Mount of Olives, and on the route which leads there from Jericho in the Jordan Valley. They were within two miles of the city. The ride into the city on the colt is in fulfillment of Zech 9:9, as Mt 21:5 makes explicit, and the acclaim of him as king by the multitude of the disciples is a quotation of Ps 118:25-26 (Keck). “Spreading” (ὑποστρωννύω, hupostrōnnúō). Is it worth noting that this word shows up only here and nowhere else in the entire New Testament. This line is much more subdued in Mark where it reads simply “...those who went before and those who followed cried out...” Luke has them reveling in joy: “all the multitude of disciples” are “rejoicing” (xairontes) and praising (ainein) God “in a loud voice” (phone megale) for all the “mighty works” (dunameon) which they had seen. Luke's scene is far more celebrative and joyous. (“Progressive Involvement,” at http://www.progressiveinvolvement.com). “Glory in the highest.” Words reminiscent of the songs of the birth of Jesus. Cf. Luke 2:14). Note that Mt and Mk have instead, “Hosannah in the highest.” (Mark 11:10; Matt 21:9). “stones” (lithos, n. pl.). Mill stone, stumbling stone, etc. Joseph A. Fitzmyer S.J., The Gospel according to Luke X–XXIV: Introduction, Translation, and Notes, vol. 28A, Anchor Yale Bible (New Haven; London: Yale University Press, 2008), p. 1242. “The Politics of the King’s Donkey,” Political Theology (http://www.politicaltheology.com/blog/the-politics-of-the-kings-donkey-luke-1928-40/). Retrieved 03/16/2016. David French, “Donald Trump Is No King David: It’s Time for Christians to Take a Stand” National Review, March 14, 2016 (www.nationalreview.com/article/432791/donald-trump-christian-supporters-its-time-take-stand-against-trump). Retrieved 03/15/2016.